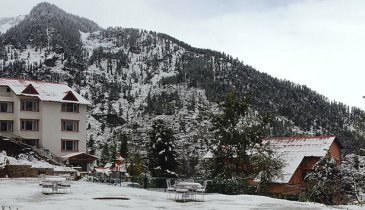 Rejuvenate in the pleasant fresh mountain air and tranquil environs of Manali. Apple Country Resort is elegantly located in lush green landscapes surrounded by mountains, valleys and bubbling creeks. Walk in the apple orchards or relax in modern comforts of spacious yet cozy rooms. It is an awesome place to stay for everyone from family to romancers to nature lovers to adventurists. The river flows just next to the resort creating a soothing music. Quench your thirst of a perfect relaxing holiday at Manali.